The 2.5Assist Dedicated server is a command line based server for use in datacenters or for professional server hosters, It is not meant to be used for running a home server on your PC. 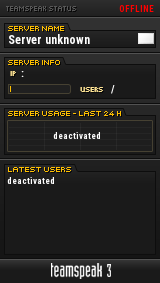 UPDATE, Dedicated server now includes MultiHome support for servers with multiple IP addresses/Network Interfaces. Post comments here if you think that the documentation needs updating in any way. That's not the map in my command line. I can't find anywhere that would be pointing to this map. Any ideas? LOL Read it again please. Have you checked aa25srv.ini ? Yes. I can't find a single reference to Insurgent Camp anywhere. It doesn't matter which map I try to load in the command line, I get that same error. In what folder are you looking in? I've tried \aa25\25Assist\armyops\system and \aa25\server but Insurgent Camp isn't mentioned in anything I've look at so far. What about the maps folder? What is your command line then? Change your command line too.